Adventure and pinball combine to captivating effect. 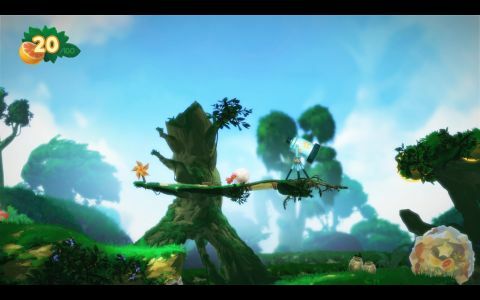 A blend of mismatched genres that somehow works, Yoku’s Island Express is a beguiling game of modest brilliance. What is it? An oddly relaxing pinball-themed platform-adventure. Think of pinball, and you think of flashing lights and clattering noise. It’s a fast, precise, demanding form of play. You certainly couldn’t call it sedate. And yet here’s a game that makes it so. A self-styled ‘pinball adventure’, Yoku’s Island Express carries itself with a carefree charm from title screen to credits and beyond, its cheerfully mellow vibe ensuring that any moments of potential frustration just melt away. From the moment Yoku—a mail delivery beetle—is sent flying up from the jungle floor through a cover of clouds, emerging against Nintendo-blue skies and the title logo, you know you’re in good hands. There’s a breezy confidence to Villa Gorilla’s debut that demonstrates a clear-eyed belief in its strange central idea. Bound to a ball via an unbreakable cord, Yoku can walk along flat surfaces or gentle inclines, but unlike most of his platforming peers he can’t jump. Instead, the flippers, launchers and bumpers scattered across the world are his main method of locomotion. Progress is fairly straightforward above ground, but dive into a pipe or enter a building and you’ll discover intricate webs of ramps and rails, alongside single-screen mini-tables and others that form environmental puzzles of sorts, spreading up, out and across the map. You’ll hit targets to free timid little creatures, scatter spores for friendly fungi, and rescue tadpoles for a giant turtle. There are higher-stakes quests, but even the boss encounters aren’t exactly high-pressure situations: let the ball fall between any pair of flippers and the brambles below merely scratch a hole in your wallet, taking a few pieces of fruit (your all-purpose currency) with them. Nearby launchers let you get back to the action quickly, and within seconds you’ll likely have picked up a grapefruit or a bunch of bananas to replace what little you lost. Meanwhile, its painterly world indulges your natural curiosity, taking you from hot springs to frozen peaks, secret bases to dripping caves—and not always by design, since a mishit can send you down a rail that winds and twists away from your intended path. Either way, there’s almost always a shortcut back, or a reward awaiting you wherever you end up. Steadily, Yoku amasses a range of weird new abilities to open up all corners of the map. He’ll dive to reach underwater temples, or roll over self-destructing slugs that attach themselves to the ball, blowing up any obstructions they hit. Yet you’ll rarely face obvious roadblocks: you seem to get each new skill just as you need it, and retracing your steps is made easier by a delightful fast-travel mechanic that lets you cover great distances in seconds. Like almost everything else in this generous, considerate game, it’s been built with player convenience in mind. And if that means it’s a little too gentle for some—or too slow for pinball connoisseurs—it’s a trade-off Villa Gorilla seems happy to accept. In its unassuming way, this is a remarkable achievement for a debut, combining two of the oldest types of game into something that feels daisy-fresh. Now that’s worth making a noise about.